Want to know which AED is right for you? 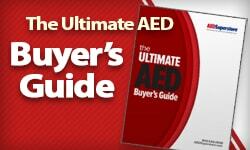 We put together the Ultimate AED Buyer's Guide provides information on:. An AED or Automated External Defibrillator is a portable emergency medical device that analyzes the heart's rhythm for an arrhythmia and provides an electric shock to the heart if needed. The devices are often kept in public places, carried by first responders (police, fire, etc. ), and utilized during sudden cardiac arrest emergencies. AEDs can be fully automatic or semi automatic and usually cost between $1,500-$2,000, with some models being closer to $4,000.00. An AED works by analyzing the patient's heart rhythm and delivering a shock to the heart if it detects an abnormal heart rhythm (arrhythmia) caused by ventricular fibrillation or ventricular tachycardia. To learn more, watch our video on how to use an AED. An AED can be used by anyone with minimal CPR and AED training. Most AEDs are intended for use by the general public and include user-friendly directions such as voice-prompts to help guide lay-persons through their use. Do I need an AED? What's the likelihood of an SCA event occuring? What are the consequences if an event occurs that requires an AED and you aren't prepared? What do regulations/laws say about your need for an AED? What kind of AED fits my needs? The best AED for you will depend on a variety of factors including but not limited to your specific use-case, budget, program management abilities and more. To better understand which AED may work best for you, take a look at our AED buyers guide or give us a call. To learn more about AEDs, please visit our AED FAQ. AED Superstore has been providing exceptional service and second-to-none selection and pricing on emergency medical equipment and first aid supplies including AEDs (also referred to as Automated External Defibrillators, AED Machines, AED Defibrillators, etc.) for over 15 years. Our passion has been and continues to be making life-saving defibrillators and emergency medical equipment available to all. 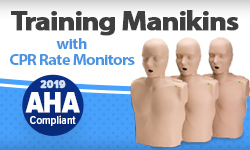 Whether you're looking for new AEDs, information on sudden cardiac arrest (SCA), need training on CPR or emergency first aid equipment like AEDs or bag valve masks, we have you covered. 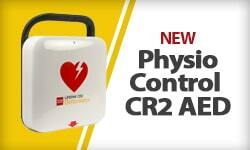 To learn more about AED Superstore, please visit our About Us page.